I read all the reviews and really followed "Cookerbob"'s advise. Here's what I changed: used 1 lb. LEAN gr. beef, tripled the garlic, reduced sugar to 1 T., reduced salt to 1 t., used 9 lasagna noodles per pan and used 1 pound mozzarella (shredded) cheese per pan. I read the reviews about omitting the fennel and I have to disagree. I believe the fennel is one of the ingredients that makes this dish outstanding. I made the sauce the day before and simmered for 6+ hours. Sounds like a lot of work, but come on! How hard is it to check a pot simmering??! I had enough sauce for 2 pans of lasagna, so that's what I did. Made 2, baked one and froze the other. I just finally made my frozen one yesterday. I allowed it to thaw in the fridge overnight and then baked as directed. Just as delicious as the first batch!!! 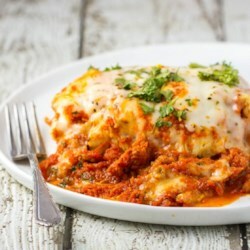 My hubby is a lasagna snob and says this is the best lasagna recipe ever. I totally agree!